When a car is designed, the manufacturer sets out a service schedule for the car, in which it recommends the intervals at which all the main maintenance tasks, should be carried out, along with recommendations for when many of the important parts should be examined and/or replaced. A manufacturer’s typical service schedule consists of a varying number of checks - usually around the 70-80 mark - and a further handful of adjustments to the workings of various parts of your car. The actual components to be checked, and the intervals at which they are examined and/or replaced will vary slightly for each car, depending on the type and size of engine and transmission, and the car’s age and mileage. Why Is A Service Schedule Needed? The most important function of a car repair schedule is to ensure that the manufacturer’s original warranty remains valid. All the checks, and their respective required intervals, are listed in every car’s owner’s manual. So in theory, anyone servicing a car can consult this, and instantly know what checks are needed on a car of the appropriate age and/or mileage. The car service schedule must be kept to while the car is under warranty - but it’s no longer necessary to have this servicing done at a franchised dealer. The important factor is that the checks are physically carried out, and the person doing them has stamped the warranty booklet belonging to the vehicle to attest to this fact. What Are The Different Levels Of Car Service Checks? Oil & Filter Change: This is the most basic and crucial of tasks carried out, and should be included in every service. An oil and filter change helps to ensure your car continues to run reliably and helps fuel efficiency. It keeps the inner workings of your engine running smoothly, and also helps ensure that the right type of lubricant is protecting it at all times. Under a statutory ‘duty of care’ which applies to any garage towards customers when they work on their car, each time they accept a car for a service, they will complete a visual safety inspection on it. This is intended to identify any obvious safety concerns with a car, even if it is just due to undergo an oil and filter change. However, a full brake check is NOT a part of these requirements. Many in the industry believe this should be carried out at least once every year. Basic or Interim Service: Car servicing schedules are usually structured in a modular fashion. So the most basic car service will include a handful of basic checks. These are mainly just inspections - but the person carrying out the work will note any problems or anomalies found, and report these to the person who’s picking up the bill. As mentioned above, these basic checks are legal requirements on a garage. On top of this, a basic service - usually carried out once a year, or at various mileage intervals if the car covers more than what is considered by the manufacturer to be average - will include a check and top-up if necessary of the levels of all the important fluids - washer, brake, steering and anti-freeze. A further checklist of up to 35 key parts will also be inspected. Although often not specified at this interval, you should also find that a reputable garage will carry out a brake check, and compare their checklist with that issued by the vehicle’s manufacturer, adding in any extra suggested measures as required. 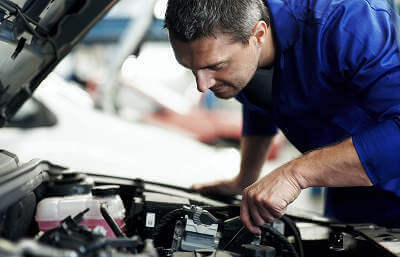 But because many garages have their own list of checks, which might not be exactly the same as that used by the manufacturer and its own franchised dealer network, you might need to ask the manager if you want extra checks to be performed, for example, if you think there might be a specific problem which you want them to investigate. Full Service: This will probably add 15 to 30 further checks on top of the basic service. Note that if the car is undergoing an MoT test at the same time, several of these additional operations are likely to be included as part of this. The full service cost may not cover any additional remedial or repair work which comes to light as part of the inspections carried out, or the cost of any extra checks above that included in the garage’s full service ‘menu’ which are recommended by your car’s manufacturer. Major Service: This type of service is usually recommended every two or three years, and again the frequency may be reduced if you cover a higher than average mileage. Extra jobs undertaken could include changing the spark plugs and/or fuel filters, and replacing any other items suggested in the manufacturer’s schedule. Below is a list of jobs typically included in full and major car services. Those included in the latter are marked with an asterisk (*). Be guided by the recommendations in your manufacturer’s service schedule, and be sure to stick to this especially if your car is still under warranty. Once your car’s warranty has expired, you need to be aware that, if you book an oil change or interim service that does not include a check of brakes and manufacturer requirements important safety or maintenance issues may be missed, which can have grave consequences. Many independent and ‘fast-fit’ garages may offer a combined car service and MoT test package. It’s very likely that this will only give you the checks needed under the basic/interim service listed above. So make sure that your garage is aware of any extra checks stipulated by the manufacturer, especially if your car is still under warranty. On the basis that manufacturers’ own judgments of what is considered ‘average’ mileage vary, you should at least know the recommended mileage and time intervals suggested by the maker of your car for basic, full and major services. To confuse matters further, they may refer to the different levels of service by other names, or might only have two suggested levels of service. If you’re in any doubt, ask your dealer, or look up your manufacturer’s recommendations online. Unfortunately, we’re unlikely to ever reach the day when all servicing requirements are standardised, so you’d be wise to find out what your manufacturer suggests, and stick to its schedule wherever possible. How Do You Protect Yourself From Unexpected Charges? Firstly, talk to your garage. Get to know the car servicing packages they offer, and try to make sure they have access to your car’s handbook, so that they can check whether any of those extra checks not offered as part of a standard service, are recommended by the manufacturer. You can then ask them to quote a price for these additional checks up-front, and give you the chance to give your specific approval. This should mean that you don’t end up with a bigger than expected bill. Also if you’re particularly keen to stick to a budget, give them a contact telephone number, and ask them to ring you so you can approve any extra jobs they find need to be done. Often, some defects can’t be spotted until some other parts have been removed. And equally, once this is done, some extra new parts may be needed so that the ones with the original defect and which have been replaced will work properly and for as long as should be expected. So you shouldn’t necessarily expect the ‘fixed price’ quote you are given to apply. On the other hand, if a set price has already been quoted, and it’s found that extra work is needed above and beyond what can be done for that price, the garage should tell you about this. Should You Expect To Be Offered A Courtesy Car? Well, not really, unless you have arranged this with the garage beforehand. Some franchised dealers will offer this to their customers whose cars are still under warranty, as a gesture of goodwill. They can do this simply because they’re likely to have a number of cars - perhaps ones used by their own staff - which aren’t needed during the day, and so can be loaned to customers who cannot manage without one. But as most car servicing work can be carried out in a few hours - half a day, or perhaps a full day for a major service - they won’t have cars available to cover all their customers’ needs. You should still discuss this with them, because of course, they should value your business, and may be able to make a courtesy car available if they know this is one of the factors which would make you likely to use them again. Once you have a reasonable idea of what’s involved in servicing your car, you can make any plans for the time when you might have to manage without it accordingly. Booking as far in advance as you can, and making clear what work you expect the garage to do will help greatly in ensuring that you know what you’ll be getting as part of your car service. Many of the problems between garages and their customers result from simple misunderstandings, or customers making assumptions about what they are getting for their money. Even if your book a car service through MyCarNeedsA.com, you should always make sure you know what the garage is offering for the price it has quoted. This includes whether a courtesy car is available, and at least a rough estimate of how long the service is likely to take. Garages can be very mysterious places to the uninitiated, but most of the staff will be approachable and know what they’re expected to do. So even when you have get your car service quote from MyCarNeedsA.com, don’t be afraid to ask the garage any questions if there’s any part of their work you need explaining to you. It’s easy and hassle-free to get car servicing quotes from MyCarNeedsA.com. You register for free, and can then post details of any work you require, whether it’s routine or unscheduled, and you only accept a quote for your car service once you’re happy with it. So post your request today, and start getting your car service cost quotes.